This weekend was time for a little mother/daughter bonding as Mom and I headed north to Pigeon Forge, TN. Richard didn’t have enough vacation time not already spoken for that he could take off to go with us, so he and Penny held down the fort here at home. We loaded up the Hummer and headed North. 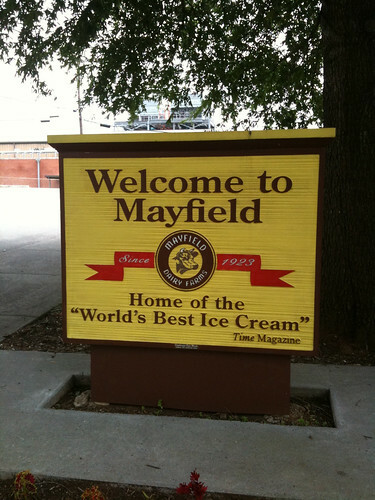 On the way, of course, we had to stop at the Mayfield Dairy for ice cream. Mom loves the ice cream fresh from the dairy. It is quite tasty – she ate a big cone of Black Walnut, and I had some of my usual Chocolate Chip. I would have posted a picture of the Humongous Cow they usually have parked outside, but evidently said cow was on a road trip and wasn’t available. Only problem on the trip was road construction right outside of Loudon… there was about a 15 mile back up on both sides of the interstate where they were doing repair work on the bridge over the Tennessee River. Took awhile to get through that, and we’ll very kindly say that Mom doesn’t handle traffic jams well. Since I’m not that familiar with the area, I didn’t know how to maneuver around the interstate, and we were essentially trapped. By the way… I noticed that there was road construction all through the state of Tennessee and it’s been that way for years. No offense to any Tennesseeans reading my blog, but srsly, people, are y’all ever gonna finish the roads??? Finally got to Pigeon Forge and checked into the Sleep Inn. Technically it’s in Sevierville, which is a hop, skip and a jump down the road from Pigeon Forge proper. We first found this little gem of a hotel this past spring when the pet friendly hotel we had booked at turned out to be horribly filthy and the owner even more horribly offensive (coughMicrotel Inncough). It is very clean; the employees are very friendly and very helpful; the continental breakfast is tasty; it’s pet friendly; and more importantly on this trip, they’re one of the few hotels that still accepts smokers. My mom is nearly 83 and she’s pretty much a militant smoker. Needless to say, she and my asthmatic self stay in different rooms. The woman who assisted with booking the stay made sure that my room and mom’s room were next to each other. Some people go to Pigeon Forge to head to Dollywood (God Bless Dolly Parton – she never forgot her roots and decided to do something for the area she grew up in. I remember when Pigeon Forge was a wide place in the road on the way to Gatlinburg). Others go for the dinner theater and the shows. Still others go for the goofy golf and water parks or for the hiking and camping in the area. I’m talking professional level. Stuff to make the weak of heart faint. Stuff to challenge even those with the strongest of constitutions. Mom loves wearing very tailored suits to church. Problem is, she’s a very, very tiny woman, and these very tailored suits are extremely difficult to find in her size. 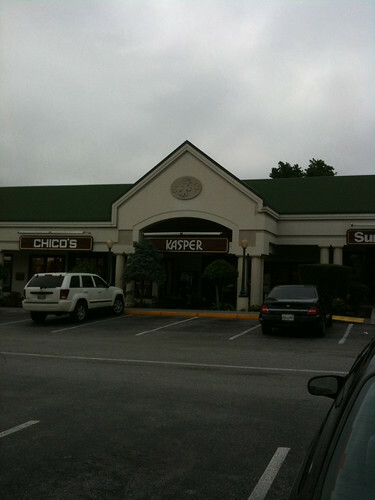 Just about the only place she consistently has any luck is the Kasper outlet in Pigeon Forge. It was the first stop we made. There’s a little woman there named Lila who remembers us (and believe me, we’re memorable) and makes a beeline to us each time we walk in the door. She will grab every possible suit in Mom’s size and put it in a dressing room while Mom walks around, and then Mom can choose while she’s trying on. Lila is brilliant. By the time we left, Mom had bought every single size 2 suit they had in the store, save for 4. We had five large garment-size bags full. It’ll be her wardrobe pretty much for the next year — or at least until her next trip. And the real problem? All of the suits are really too large, but we can’t find anything any smaller… I had two other sales people helping me load the Hummer. From there, we made a brief detour to the Polo outlet (I do love me some shirts with Polo ponies), then we hit the Coach outlet. Coach was extremely crowded, but I managed to score a couple of items. After lunch, we headed to Dixie Darlin. 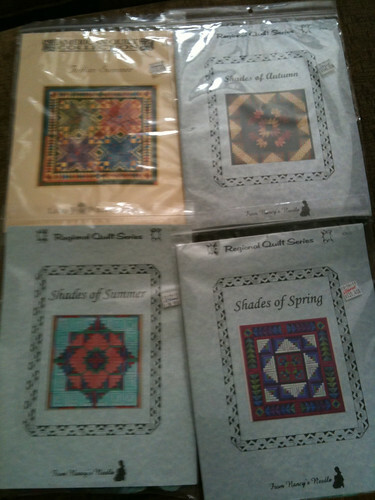 It’s a needlework shop that’s well stocked with fabric and fibers… it has a few counted thread charts I like, but my big attraction right now is the collection of counted needlepoint charts by Laura J. Perin and Nancy’s Needle that they kit. This time I was actually smart enough to make a list of the kits I had so I wasn’t afraid of duplicating anything. Mom very kindly treated me to some kits as a thanks for doing the chauffeur work. From there we checked out Mr. Tablecloth, that had the new collection of Vera Bradley, and then dodging rain showers, headed over to a store that sells Brighton and Pandora just to have a look. By that time, we were ready for dinner. 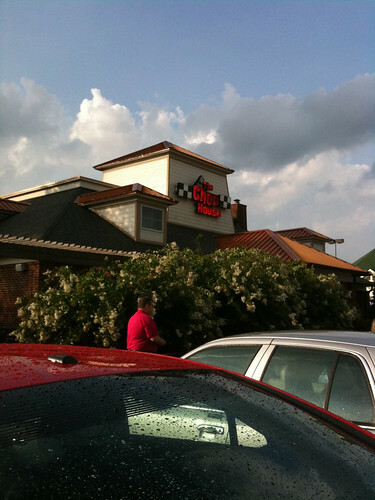 We had never tried The Chop House, which is right in the middle of all the outlets. What you have to understand is that both Mom and I like our steaks well done (yes, I realize some of you think this is a sin against nature, but work with me here). There is a real art to cooking a steak well done and having it be both tasty and juicy (Ruth’s Chris, I’m looking at you). We both got filets, butterflied and well done; mine was horseradish encrusted. Our salads came out, obviously freshly made, because we had each asked for different items to be omitted. Plus 1 for the Chop House. Steaks came out. Mine was fine. Mom’s was slightly undercooked, so she sent it back. It came out again promptly, cooked to perfection. Another plus 1. Then the manager came over to check on us. BIG plus 1. The steaks were delicious — so delicious in fact that my picky eater mother ate the whole thing. (Cue Gordon Ramsay delighted sounds.) And the best news is that when we come back with Penny, they have an outdoor patio where we can eat with her, or they’ll do takeout for us. We did a little more shopping after that, but we were pretty much beat, so we went back to the Sleep Inn and turned in for the night. Got up this morning to come home, but made one more fast detour past…. Yep. 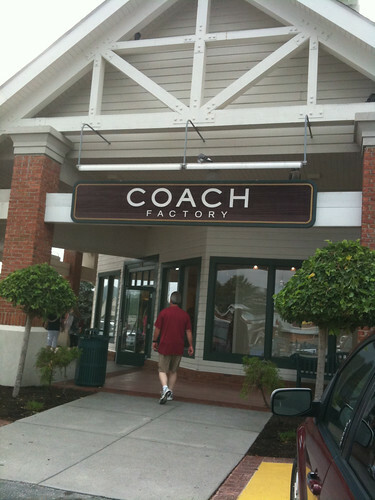 Back to the Coach outlet. Mom had been looking for some purses, and didn’t find any she liked anywhere else, so we went back there so she could find something nice. It wasn’t as crowded early in the morning, so we were able to take our time looking and we had a salesperson to assist us. From there, we took a different path home to avoid the construction over the river. We decided to take US 411 home… it was a nice drive. Good road… very little traffic… Mom enjoyed the drive through the countryside. Almost had a problem in Etowah, TN, when the Hummer spooked the horse drawing the buggy full of Amish people. I came to a quick stop before it was Hummer 1, Amish people 0. You don’t see that kind of stuff on the interstate. So Mom is safely home. I’m safely home, ready to have dinner with my hubby (who so kindly unloaded the car and unpacked for me) and watch some racing tonight. Happy to be back in front of my TV and my computer!! Sounds like you and your Mom had a real girls (early)weekend. I envy you. It sounds like you had a great time! Greg and I go to that area every November. We LOVE the Chop House. I would agree with your “meh” rating on the apple place. Not sure we’ll go back. The Tanger outlets are so busy that they drive me a bit nuts.